Here you can configure the AquaMagnet function of AquaSnap. To access this screen, double-click on the tray icon, at the bottom-right corner of the screen, and click on AquaMagnet. 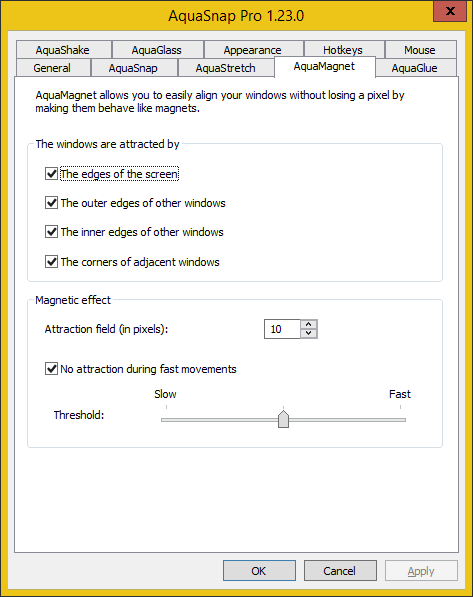 AquaMagnet makes all windows behave like magnets attracting each other when they are close enough. This helps you to easily align your windows with a pixel precision. This effect is known as "window snapping" and has been first seen in Winamp which uses it for its main window. The edges of the screen: if enabled, the windows are attracted by the edges of the screen. The default value is enabled. The outer edges of other windows: if enabled, the windows are attracted by the outer sides of the borders of the other windows. This helps you to easily align adjacent windows. The default value is enabled. Magnetic effect: here you can configure the parameters of the magnetic effect added to the windows. Attraction field (in pixel): this is the distance to which the windows begin to attract each other. The default value is 10. No attraction during fast movements: if enabled, the magnetic effect is progressively disabled when you move the window quickly to prevent choppy movements. The default value is enabled. Threshold: this the speed threshold for the disabling of the magnetic effect during fast movements.